The Academy Plaza Hotel is one fine option right in the heart of the Dublin city centre, when considering accommodation at many Dublin City Hotels. The Academy Plaza Hotel is located right at Dublin city centre in Findlater Place, off Upper O'Connell St, Dublin 1 Ireland. The hotel has a modern luxurious feel to it from the minute you step through the doors into the magnificent marbled lobby. This Dublin City centre hotel is a superior three star hotel and it is just a short walk from most of Dublin city centre's shopping, cultutal and etertainment districts. This 3 star hotel off O'Connell street Dublin offers 304 deluxe and executive bedrooms which are contemporary in design, decorated in an inspired blend of strikingly stylish colours and finished to the highest standard, with every modern convenience in each room. The Best Western Plus Academy Plaza Hotel in Dublin features Plaza Bar & Grill restaurant where it offers outstanding dishes to ensure you leave having enjoyed a truly beautiful dining experience. Its expert chefs have designed a fantastic menu for you to choose from catering to all tastes no matter what the occasion. Full Irish breakfast in the restaurant which is open daily from 7.00am until 10.00am Monday to Friday and opening from 7:30am until 11am on weekends. Times may vary during Bank Holiday and other Holiday periods. A great place to stay in Dublin city centre, it is just short walking distance to one of Dublin's greatest sport venues, Croke Park, the other sport venues such as, Aviva Stadium are also located a few minute from the hotel. Also pleanty of places in the hotel and around it to catch up with all major sports as they are televised. The evenings the atmosphere in the hotel is a bit more lively as there is often live music, it is a popular destination for both guests and locals alike. 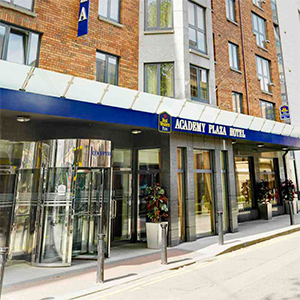 The Best Western Plus Academy Plaza Hotel Dublin is ideally located in the heart of Dublin city centre with close proximity within capital's major music venues such as 3Arena, Bord Gáis Theatre, Olympia Theatre and many more. The Best Western Plus Academy Plaza Hotel in Dublin city centre is the ideal venue for large corporate events, discreet boardroom meetings, seminars, conference, function and product launch. The hotel boasts facilities to accommodate up to 120 delegates in its largest suite, the state of the art AV equipment and complimentary WiFi as well as the dedication of the experienced management team ensure that your conference or meeting is carried out efficiently and professionally to the highest standard.